Forum Waterford, The Glen, Waterford, X91 AH24. April FREE monthly draw - Tuesday April 30th. Wicker sofa and table. You MUST be in on the night to win! May First Tuesday Special - All Book Full Panels DOUBLED from €150 to €300. No increase in cost of the book - Tuesday May 27th. Formally known as the Regal Cinema, Forum Waterford opened, after major renovations, in 1990 as an entertainment venue and went on to host top International Artistes such as Johnny Cash, Billy Connelly, Scissors Sisters, Calvin Harris as well as many of the Irish greats like The Corrs, Van Morrison and Christy Moore, to name a few. Today Forum Waterford incorporates one of Ireland’s top Bingo Clubs (Forum Bingo) as well as an award winning Off-Licence (Number 21) and a suburb designed Chinese Restaurant (Peking House). Amongst all the uses over the years (Cinema, Live Venue, Function Room, Comedy Club, Bars and Night-Club), Bingo has been a constant and in fact has now run on the premises for over 50 years! 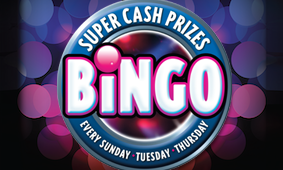 Bingo currently takes place every Tuesday, Wednesday, Thursday & Sunday. Doors open @ 7pm each night with Pongo starting at 7.35pm and Eyes Down @ 8pm for the main Bingo session. Last game of the night is over around 10pm. 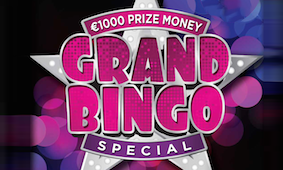 Link Bingo and Link Pongo also takes place nightly with other Bingo Clubs around Ireland, giving even bigger wins. Visitors are very welcome but please note children are NOT allowed on the premises and all players must be over 16. Management reserve the right to refuse admission to anyone, without explanation. (Bus Details Here) and returns afterwards. Forum Bingo Membership, which offers awards to members (including a free book on your birthday) is available to all customers. Simply just complete an application form and hand it in, after which you will get your FREE membership card. Forum Waterford Main Bingo Charities are St. Paul’s Building Fund and Waterford Hospice Movement. Every Wednesday a special cause is specifically supported on the night. We hope to see you at Forum Bingo where you might get to call “check!”. Coherent Enterprises Ltd. Reg. in Ireland, no. 78291. ℅ Fitzgerald Power, Greyfriars, Waterford. Director: Ciaran O'Neill. Website by Assure Web Design.